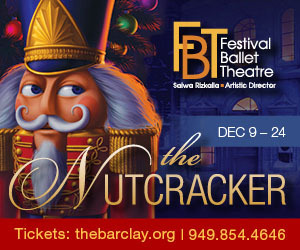 American Pacific Ballet presents The Nutcracker starring Kate Kadow, international guest performer and member of State Street Ballet, as the Sugarplum Fairy and Taras Domitro from San Fransisco Ballet as the Cavalier. International guest artist Brian Loftus will play the role of Drosselmeyer. Chiaki Takebayashi and Maddie Simmons from UCI will also perform as featured dancers.